Fifty years ago, Jaguar commandeered a lakeside villa off Geneva's Quai Gustav Ador, where it unwrapped a grand tourer Enzo Ferrari would later call the "most beautiful car ever made." That was the E-Type. Today, in celebration, here's the XKR-S.
What a difference five decades make. Regulations may dictate we'll never see another Jag as lithe as the XKE, but we can see one that'll kick the old boy into the weeds in any gear. The XKR-S is a further performance upgrade from the XKR, with more power, a functional aero kit and as-yet-undisclosed suspension tweaks other than a reprogramming of the XKR's Adaptive Dynamics system. 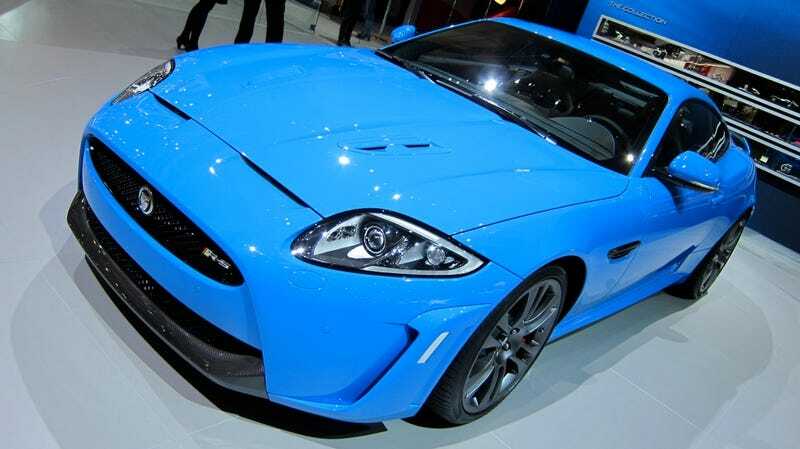 The XKR-S's supercharged 5.0-liter V8 produces 542 hp and 501 lb/ft, which pulls from 0-60 in 4.2 seconds, on up to 186 mph. Here's where we love press-release writers sometimes: the media literature indicates the XKR-S will "dismiss" 0-100mph in 8.6 seconds. Dis-MISSED! Jag also says it's the most agile, responsive and driver-focused it's ever built, and it emits less than 300g/km CO2. Huzzahs all around for the polar ice caps!